I like Ryan Reynolds and I like Jeff Bridges. Unfortunately, being an actor is a lot like being an assassin. When you’re offered a job you have to take the job no matter who it will hurt. Back in April I predicted that R.I.P.D. would be Ghostbusters meets Men in Black and couldn’t possibly live up to that potential. It hasn’t, and I suppose we can blame the lackluster writing for that. The cast boasts the great Kevin Bacon, the smarmy Mr. Reynolds, the venerable Dude, and the snarky Mary-Louise Parker (whose vocal cadence continues to baffle and titillate me after so many years) – none of whom do less than what is required of them. And we cannot blame the special effects, though I badly want to. The monsters of this feature (referred to by the uninspired epithet “Deados”) are little more than cartoons painted on the celluloid, whose monstrousness extends as far as having a few more eyes than normal, a few more fingers than necessary, or being fat. Perhaps the original draft of R.I.P.D. packed a little more punch but what has been committed to film is a toothless, CG-heavy snoozer, stocked here and there with a few giggle-worthy moments provided by the perennially game Mr. Bridges. Ryan Reynolds plays Nick, a fifteen-year Boston PD veteran who’s a little dirty but for the right reasons – he wants to give his wife a better life (i.e. more money). When he is killed by his partner, he is granted the chance to redeem his sins by enlisting for 100 years of service in the Rest in Peace Department. He is partnered with Ray (Jeff Bridges), an 1860s lawman who is definitely not Rooster Cogburn but wouldn’t mind you making that mistake anyway. Together they must stop Deados (urgh) from getting the pieces of a golden artifact that will bring about the apocalypse (in case you weren’t tired of apocalypses this summer). What the film lacks is any sort of direness. It springs for the spiritual stuff almost straight away, with a story that is modeled for children and teenagers but told as if it’s for adults. Neither will have much to chew on here. The concept of a spiritual police department is interesting, especially as stocked by the best (but not necessarily brightest or moral) police of a city’s history. The film toys with the very real concept of grief and the lives that must endure after the death of a loved one, but swiftly runs over that in pursuit of tracking down dead monsters whose biggest crime seems to be a desire not to die. I suppose they’re trying to escape from the Hell that awaits them but the word “Hell” is spoken perhaps one time, the idea of damnation referred to obliquely as “the judgement” elsewhere. This reticence to commit to its Biblical stakes is a symptom of its insubstantiality, not its rating. Remember, 1984’s Ghostbusters was a PG movie, and yet that had bigger scares, funnier jokes, and genuine heart. R.I.P.D. seems to hew to the timeworn film fallacy that if it litters its dialogue with enough “shits” it can fool its audience into thinking they’re watching a grittier movie than the inflated sitcom they paid for. It still doesn’t work. R.I.P.D. also falls prey to that most irritating of Hollywood dilemmas, acknowledging its cliched formula without doing a single thing to overcome or even sidestep it. The buddy-cop genre is a classic one, and the idea of pairing a 2013 Bostonian SWAT man with an 1860 cowboy seems ripe for exploitation. 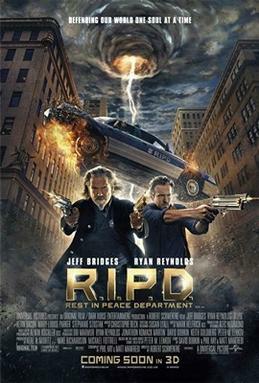 But the screenwriters have narrowed down the definition of “cop” to “guy who points gun at bad guys,” and so our time-displaced duo are reduced to “young cop who is sarcastic and miserable the whole movie” and “old cop who is still pissed off about being eaten by coyotes,” both of whom point guns at bad guys. I’d also like to point out that their bullets “erase” Deados from existence. I suppose I shouldn’t be too pissed off that this bloodless death is given barely two seconds’ lip service of explanation, but I am. I’m all for genre-stretchers like what R.I.P.D. thinks it is, but the film is little more than its basic concept, with no desire to get into the incendiary politics of the afterlife or do anything more with its characters than have them chase badly animated goons. By this point I shouldn’t be appalled that this summer “blockbuster” cost $130 million to make, but I am. I’m tired of this big-budgeted tommyrot. Though apparently, so are you.